Today we have added a less serious world called Testera. Anyone can login to this world by the character option: Character (Testera) in the client character list. Testera is a world there people can make some fun fights while mana sitting/or whatever reason they may have. The purpose of this world, is to Test the client in PVP-situations. We will develop the client and test in on this world for more live-action which make it a lot easier to understand the clients flaw under stress. Notice however, Testera is a unserious world, restarts can happen at anytime. And the amount of players in Testera does not count towards MasterCores total number of online. Testera is located in Germany. If you have any opinions or other things to say about Testera, please keep it within this thread. We don't want the boards of MasterCores to be drowned in subjects about this Test-World. Two screenshots from Testera which I took a moment ago, with 107 players online. Multi-Client rules does not apply to Testera. You are fully allowed to have 2 characters online in MasterCores worlds + 1 in Testera at same time. Some useful things I noticed pretty quick as far as movement.. When using keys to move, not autowalk/mapclick and you use anything, rune, mana, open/close bp it seems to stop your movement and say "Not possible" for a short moment and then allow you to continue. If we could open bps and use mana or runes without this quick pause would make it much smoother. I'll add any more I notice here later. Good work with Testera, it's a very cool idea. Hire a new brazilian GM or even a tutor. This will really help Demera development. I know a few names that could help the team in that way. Hello! i would like to present some changes of Testera for you! 2. Make it HARD to get m lvl 40. else ppl will only stand in temple pump mag 40 and go out UE, die and do it all over again. 3. 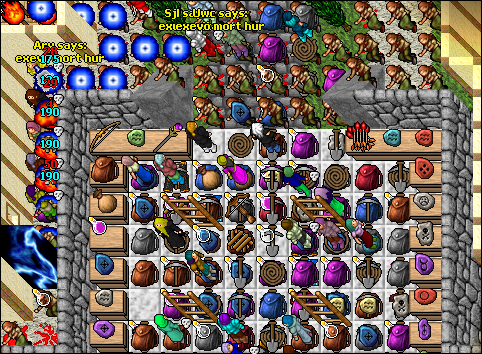 Remove the pots, people cant handle it.. trying to block of temple. 2. Make all skill progression slower, so we don't have people getting abilities like ultimate explosion so easily..
4. Allow us to see how many frags we've taken and by extension how many deaths we've endured. 5. Allow us to get Rings of Healing, Soft Boots, and Better Equipment either via the temple upon logging in or via mini-quests. Dear marcus, pleaso do something with botters on DEMERA, they're using bot everytime.... PLEASE BE MORE ACTIVE ON DEMERA AND DO SOMETHING. Can you Target a player , then hit a sd in less than one second ?? Let's get SSA's, energy rings, might rings, and even elven amulets and time rings into the test world, you want us to practice pvp and all of those are crucial in survival situations. If you can't do the amulets at least some rings..